Subscription Applications / Renewals are due from the 1st April each year. Despite the light winds, 8 rounds were completed before the wind became too variable to continue. The final results was a win for the ever popular Mike Shellim, second went to Rich "Mr T9" Bago, and third to Mark "Shirt Sleeves" Treble. Mark T also took the FTD for the weekend with a 45.20 in R7. Great result guys, well deserved. 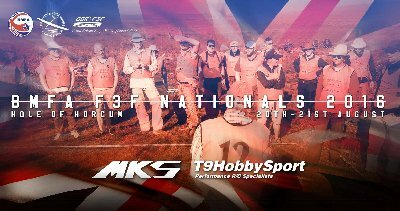 This is it before the Champions of Champions Event on the 30th / 31st March at Horcum. Well, turned out nice again! Problem was which slope should we be on? So in the intervening period, the forecast and actuals could be well studied and debated. Result - South Bowl! Ten pilots set up camp on the South Slope, and with the mist beginning to lift, flying finally got under way at 11am. Winds were surprisingly square on for most of the day, but the bowl will 'straighten' up the flow even though the wind could be crossed. 6 to 12m/s wind speed at the start and end respectively, resulted in a nearly a third of all flights being sub 40's. After a surprisingly variable days flying, and 15 rounds, the eventual winner with some terrific flying was Mark Redsell. In a close second was Peter Gunning with some equally inspiring flights, and third was Steve Haley , also with some quick flights, so much so , that Steve took FTD with a 33.20 in R12. South Westerly winds meant we were going to compromise on slope choice as the direction falls between the South bowl and Levisham. However there were sufficient west in the direction to make Levisham work reasonably well. With 10-20mph there was potential for some good racing. Only 7 pilots managed to attend for various reasons, but with support from all, flying was fairly continous, but to ease the frantic efforts to keep the bases manned, breaks in flying were made every five rounds, and with 15 rounds completed a good days racing was had by all. Forecast for 7 - 8mph WNW winds is a bit on the low side, especially for the likes of Levisham which is not the tallest of ridges. Ideally 10mph is the lowest figure to give a sporting chance of a good days flying. With a High pressure slap overhead, the prospects of an improvement in the forecast looks slim and hence the comp was cancelled. The day started with three consecutive sub 40's and the trend continued with nearly half the flights being sub 40, throw in a couple of PB's ( Ewan and Steve that I know of ) and at the end of the 11 rounds, I think one could say the 17 pilots had a good day!! Weather forecast was not too good, and that put folks off attending. Saturday was a lovelly day, winds a bit on the light side but Levisham was an easy slope to get to with all the models. Fair turnout on Saturday, but Sunday was a dissapointment. Weather much better than forecast with winds on the NE slope, but lack of flyers meant the event was called off. Shame as a lot of effort was put into the organisation. Hopefully next year will be better. A great social gathering as well as a hard fought flying comp. A great weekend, weather was kind to us with flying taking place on all three days. Winds were light and variable, but that just added to the unknown of who was winning and who wasn't! The GBRSRA AGM took place as usual on the Friday night, details to be found here. So after 14 rounds the man in front with some terrific flying was Joel West,well done mate, second place went to Mark Treble, with John Philips third. FTD went to Stu Wallace for a 'cracking' 38.17 in R2. Mike Shellim was voted 'the most improved pilot of the year' by GBRSRA members, and was presented with his trophy by Mark Treble. A great spectacle of modeling activity for all forms of power models. The Glider Nats are held over the same weekend, but at the new BMFA site of Buckminster. My hopes for good weather over the weekend was ill founded. Saturday was good, but Sunday was a washout. . I attended the Swap meet on Sunday morning. Footfall was badly down compared to other years. Shame really, as a lot of effort goes into this event. Oh well, here's to next year! What a fantastic weekend for our Eurotour and World Cup event. Blue sky, blue sky and you've guessed, blue sky! The only problem with all that blue sky was it didn't come with any wind!. Well it did, just a bit, but it was variable in strength and direction, as the whole of the UK was under a huge High Pressure system. Of the three days, Friday looked the best day, but the variability allowed us to scrape in only 2 round of competition on the NW slope. Saturday, again on the NW, we managed only 1 round, and Sunday we all had written off as the worst day with the least wind forecast. But how wrong can you be. The South Bowl came up trumps, with most consistent wind of the whole weekend. Another 3 round was added to our tally, making for 6 in all. We would have liked more, but hey, it was legal as only 4 rounds are needed for it to count. So congratulation to Sebastien for first place, Keith in second, and Phillipe in third. Thanks to everyone for their patience whilst waiting for the wind and your help shifting all the gear. Mark T for organising the event. Graeme, Brett and John T for buzzer supremo's. After a difficult decision at the start, with the wind due to turn from S to W during the day, which slope should we start on?. Levisham for W or Horcum main bowl for the S.
And that proved to be a good choice. Slightly off at the start, but by the time the rain hit, it was a full Westerly. An hour stoppage for the weather, meant only 2 rounds completed by 2pm ( one round lost ). But the rain cleared, the wind picked up and another 7 rounds completed. Hope you all continue to suppoprt the Club in 2018. Unbelievably, a second blast from Siberia is due to hit North Yorkshire on the day of our last Winter League Comp. With bitterly cold Easterly winds and more snow on the forecast, the comp was declared OFF. So ends our Winter League series for another year. Many thanks to all who supported us, and look forward to a sunny ( and breeezy ) year ahead. Well the "Beast from the East" as the media called a spell of severe weather coming in from Siberia, put paid to any chance of running a comp on Saturday. Not only was there a fair amount of snow at Horcum, travel around the UK was also a problem. The competition was cancelled. We are now left with the last reserve date of the 17th March. Well, a good day once we started flying, but we had a long wait for the mist to clear. Don't trust a weather forecaster, especially one which predicted a breezy sunny afternoon. Just as we were giving up, the cloud suddenly lifted and there followed a frantic scramble to put the course up again and re-rig models. We finally got the first round started at the very late hour of 15:15. So the 8 pilots finally got to enjoy the delights of light winds on the South Bowl, with Peter Gunning coming out on top, Ewan Maxwell in second, and Rich claiming third. FTD went to Peter with a 50.68 in R1. Well done guys. The forecast for Saturday was for very little wind, variable direction, and chance of some rain. The comp was called off - an easy decision for once! Great day! Weather forecasts were spot-on, with 20-25mph NE winds, occasional showers and bitterly cold. However I had enough clothes on, that I felt like a well trussed Chicken on Gasmark8! Wind dropped as the day progressed, but never-the-less, the 8 pilots managed a respectable 12 rounds before dusk descended and we marched, well staggered, back to the carpark. A welcome return of Mark Redsell showed he had lost none of his flying skills, with a decisive win, with Greg Dakin in second and Rich Bago third. FTD also went to Mark with a 34.33 in R6 . F3F Winter League R2 2nd Dec 2017 Cancelled! With a great start in November to the WL, to expect December to come up good as well was probably asking too much, and indeed it was! High pressure off to the west of the UK dominated the weather pattern for the weekend with light winds forecast to continue right into the following week. As a consequence, R2 of the WL was called off. First Round of the the Northern Winter league got off to a slow start due a band of rain crossing the area during the morning. It finally cleared to give an almost clear blue sky for the rest of the day, but left with a wind that couldn't make its mind up whether it was W, NW or WNW. Levisham site with a WNW location is not ideal, but we did get a rather ponderous 5 rounds in, making for another interesting Levisham experience. However the conditions appeared to favour Steve Haley who had his first F3F WL league win, well done mate. Peter Gunning Second with Greg Dakin Third. FTD also went to Steve with a 46.90. The last of the BMFA Summer League event at Horcum has been cancelled due to poor weather forecast. Usual naff forecast by the MetOffice! - Rain no where near as intense or as prolonged as predicted. FTD was 35.39 by Inaki. Great result for Rich, this is the second time this year he has been the highest placed UK pilot in a UK Eurotour - well done mate! Terrific weekend weatherwise, probably the best for some years!. Didn't appear to be as many spectators there this time, certainly the 'bring and buy' which I sold some items at, did seem quiet by comparison. The trade stands were also down in number. But the flying was up to standard, with the 'show line' well attended. The Silent Flight Nationals were held at the new Buckminster site. This is a great venue, but despite being 43 acres is small by comparison to Barkston; two glider comps per day is about as much as it can take. Event cancelled due to poor wind forecast. History will show whether that was a good call, but XC forecast on the Friday evening prior to the event showed little wind, and from a constantly changing direction! Fantastic weekend, one of the best flying sessions we have had for some time. Forecast was looking like Friday would be our best day, and Saturday and Sunday would be bright but with no wind. Friday started badly with heavy mist on the NE slope allowing only 2 rounds to be completed before the wettest of wet drizzle descended upon us. Saturday started bright with the predicted light W winds which meant we were now on lovely Levisham, and things just got better and better from there. The wind built during the day, the sun shone and the flying became ballistic. 8 hours and 8 rounds later the flying stopped, food,drink and bed beckoned. Sunday, much the same, but the wind had shifted slightly to WNW, which for Levisham was not a good direction. Any north in the wind makes the hill very variable, or should I say more variable, and so it was. Launching into bad air was like making progress in treacle, but good air meant hanging on as things were about to get ballistic. Another 6 rounds completed before the early finish to allow everyone to make a start for home, made for a grand total of 16 rounds over the weekend. Many thanks to everyone for helping with carrying and setting up the equipment. Special thanks to our two Buzzer Supremos, of John Treble and Ewan Maxwell, and to Mark T and Rich for CD'ing and manning the center. This annual gathering has moved from Harrogate to its new location in Docaster. Not so many aircraft this year but the usual engineering stuff, but can't help thinking the big traders are getting fewer and fewer. Did any of you make it? The annual challenge between the various Winter Leagues series was held last weekend at Horcum. A great two days were had by the 15 pilots. The Saturday being the more productive day with 9 rounds completed on the South Bowl before the wind did a complete about turn and the menacing looking clouds which had formed behind us suddenly let rip. A bit of a soggy walk off the hill to say the least! Sunday was not expected to be any good due to the light variable winds forecast, but in fact we managed another two rounds on the NE ridge before the wind deserted us completely. The final results were a great win for Greg Dakin, crowned Champion of Champion, with Simon Thornton in second, and Rich Bago just a few points behind in third. FTD went to Greg with a stonking 39.80 on the first day. Thanks to Simon for organising the day, John Treble for Buzzer Supremo, and to everybody for mucking in and help to carry the gear and run the show. Well I can quite understand why we had such a low turnout. The weather forecast never stood still. Certainly when we arrived at Levisham, the wind was all over the place, and it looked like we were to be denied a comp. Still ever hopeful and with an improving forecast, the 6 pilots stuck it out until lunchtime, when the wind direction became more consistent although the strength began to drop. However, 10 rounds later we were all happy bunnies to have produced a result, even though at times the flying was pretty variable. That's it for another Winter League. The Northern Winter League on Saturday 4th March was called OFF. The rain showing on earlier forecasts moved off into the North Sea, leaving only clouds and light winds behind. The prospect of standing around on the slope waiting for the wind to pick up didn't appeal, but in the event even the clouds dispersed leaving a gradually increasing wind of 10-12mph by mid afternoon. Phew that was close in the sense that it nearly didn't happen! Thick fog, or to coin a phrase 'clag' persisted on the South Bowl all morning. Current Met Office forecast was for it to stay all day, so things were not looking too good. A deadline of 1pm (ish) was agreed upon. If the fog didn't lift or at least show signs of lifting by then, the comp would be called off. The great news was the fog did lift and we were on the first round by 1 o'oclock. 11 pilots managed 8 rounds in the few hours of reasonable wind and daylight left. Whilst the conditions remained misty, a steady 8 - 10m/s SSW wind did allow for another close competition. Greg once again showing his dominance, Mark R in second and Steve in third. FTD went to Paul Garnett in 39.74 ( the only sub 40 of the day ). Nice to see Paul after what must have been a 2year absence! Thanks to everyone for their patience and for helping with running the show. Terrific day on the slope! The 4th Round of the Winter League was greated with a good SSW brease and largely sunny day if not a tad chilly!. However the 8 pilots enjoyed the day, managing 12 rounds before the wind finally died. Fifth Rounds of the Northern Winter League is scheduled for the 4th Mar but due to the fact that we have missed 2 events, the reserve dates now apply. These are the 18th Feb and 18th Mar. Third round of the Northern Winter league is scheduled for this coming weekend. Weather forecast all week had not been looking great. Unfortunately things didn't change, and the forecast for Saturday was for wind speeds less than 7mph. As this is less than the 'legal' speed rquired for F3F the comp was called OFF. Second round of the Winter League has been called OFF. Forecast is for winds speeds of only 2-4mp caused by a High pressure system slap over Horcum. Well that wasn't too bad. The predicted showers did materialise, and despite being very heavy, were generally short lived. Never-the-less every round had at least one stoppage for rain, and the air between could be a bit tricky as well. However the 9 pilots did managed 5 rounds on the NE slope before the wind swung too far west to continue, and with the prospect of more heavy rain to follow, a hasty retreat to the carpark was made before the next down pour. The UK team is Martin Newnham, Mark Redsell, Simon Thornton. John Phillips is the Team Manager. Terrific performance from the team. Variable conditions towards the end of the comp just didn't go in favour of our guys. Great effort non-the-less. For full info, including a map of the slopes with details and photos and the list of pilots here. Usual three day jamboree down in a partly sunny Wales was its usual gathering of flyers with great banter and serious competition. Three different Welsh slopes on the three days made for one of the closest comps I have known for sometime! 49 Pilots managed an amazing 13 rounds over the three days. To avoid losing a round due to weather, R2 was Group Scored with the flying split into 3 Groups. Friday evening was the GBSRA AGM, followed by a curry evening on Saturday, and yes the drive home on the Sunday night was its usual slog! Yet again we find ourselves faced with a dire weather forecast for the weekend. After all the great weather we have enjoyed so far, as soon as we are due to run a competition, the weather gods throw the very worst at us, and bring in a stonking low pressure to liven things up. Well, we should not have worried, the forecast for lots of rain didn't materialise, and the 15 pilots who braved the forecast were presented with an absolutely brilliant weekend. Thirteen rounds completed on Saturday ( OK one round was lost due to rain, but that was all ) and a further 10 rounds on Sunday making an unbelievable 23 Rounds for the weekend. How good could it get. Saturday saw wind gust on the South Bowl approaching 25m/s, providing some very fast flying, whilst Sunday on Levisham provided the variability that only Levisham can provide. After all that, the results were, Mark Redsell was the winner, Peter Gunning in second and Rich Bago in third. Fastest time of the w/e went to Mark R with a 32.73. Well done guys, terrific two days. Many thanks to T9Hobbysport and MKS Servos will once again sponsored the event, to Mark Treble for CDing, and everyone for their help in shifting equipment and mucking in with the self managed buzzing. Watch owner has been re-united with his timepiece!! Many thanks to Michael Terry for his efforts. "We were flying at Levisham on Saturday and had parked at the end of Braygate Lane. As I was unpacking the car I found a man’s watch in the grass where we park. It looks like it has been there for a while but has cleaned up and is still working. I was wondering if anyone had reported losing a watch up there or if you could mention that one has been found. It would be nice to returned it to it’s rightful owner". Well that was a frustrating weekend weather wise. Saturday forecast was for very light variable direction winds, the comp was cancelled on that basis and the forecast proved to be spot on: Saturday was not flyable. Sunday forecast was not a great deal better but at least had more potential, until that is the Met Office issued a warning for heavy rain all day Sunday, at which point we cancelled the Sunday comp as well. Now if ever a forecast was wrong it was this one. No rain, in fact a bright sunny day, and by tea time a strong, 30mph+, westerly had developed.Frustrating or what! Sorry Guys, lets hope for better next time. I finally managed to attend and help at the event this year. This is an initiative run by the BMFA for some years now, and is open to Colleges and Universities, to design, build and fly, a model aircraft to achieve one or more of 3 challenges. These challenges are 1, to transport as many tennis balls as possible, along a predetermined flight path, in 10 mins. 2, to fly a very large block of balsa around a course, completing as many laps as possible, in 8 mins, and 3, carry up to 4Kg of water ballast, again along a prescribed flight path. Some terrific model creations, some more successful than others, but great fun and determination from all the Teams. Oh and I should say, all this with an electric powered aircraft with a specified motor, 40A speed controller and 2200mAhr 3cell LiPo. Now there's a challenge!! As you can see from the title, the show has moved from its original location of Harrogate show ground to its new and permanent (?) residence at Doncaster Racecourse. Unfortunately I wasn't able to attend this year, but a report from an engineering colleague advised me that it was pretty much business as usual. I know the Harrogate Model Aircraft Club didn't exhibit this year, but there was still a good selection of models aircraft on show I'm told. As previous years, the Winter League Fly-off was held in not so sunny Wales the first weekend in April. Forecast as usual deteriorated the minute we set off on the the long journey South! The rain which was supposed to clear first thing Saturday morning, now persisted in more sense than one, into the afternoon. However when it did clear, it was a glorious Spring Day, with a steady SSE wind. The 27 pilots managed a busy 5 rounds before the wind swung too far off the slope to allow flying to continue. This gave plenty of time to head back down to Bridgend for the traditional Curry in the center of town. Day two, again not so bright, mist on the hill and rain to come. A decision to move to another slope known as the Crest, brought groans from the assembled pilots, as this meant a fair walk ( 1mile app ) to the flying site, which didn't please all. Never-the-less the course was set up and flying got under way at around 11am. Two more rounds with a break between for rain were completed, before the darkening clouds suggested we got off the hill whilst it we were still reasonably dry. The eventual winner was Simon Thornton, retaining his title he won last year, Peter Gunning second, and Martin Newnham third. FTD also went to Simon with a 34.75. Another socially excellent weekend with a spot of flying thrown in for good measure can't be bad. The final event of the 2015 / 16 calendar had similar conditions to the previous comp, ie Northerly winds, 5 to 9m/s ( 10 to 20mph ) but with the added distraction of drizzle at the start. Fortunately that cleared fairly soon to give a steady but overcast day. As usual with only 7 pilots, a hectic day ensued, with frequent breaks to gives pilots time to recover from flying and buzzer duties. Never-the-less, 15 rounds were achieved. Mention must also be made for Tony Hollings, competing in his first F3F comp with a sub 2m model. Giving him a win in his class ( being the only 2m competitor! ) and a great day out. Well done Tony. Well we have a second result. Forecast was spot on, NE winds, well NNE actually, 5 to 15 m/s (11 to 33 mph approx ) lots of blue sky, with a sprinkling of showers. 15 rounds with 9 pilots makes for a hard day. By the time we finished at 4:30, we were well and truly cream crackered, despite a break for lunch and another for afternoon tea ( without the china tea service of course! ) . Very close at the top, with Mark R taking top honours, Rich B a very close second and Peter G not far away in third. FTD went to Mark with a cracking 30.59. Thanks for everyone for formulating their own buzzer manning regime and all the help shifting the gear on and off the slope, much appreciated. At last a result!! Forecast looked half decent, with WSW winds anywhere between 13-33mph but with a risk of showers. In the event the wind forecast was pretty much spot on, although it did swing SW and decline as the day went on, and as for the showers, one sprinkling around midday which hardly affected us as we had broken for lunch! Only disappointment was we could only muster 8 pilots, and one of them dropped out before the start. However we managed 15 hectic rounds in Levisham's usual variable conditions. Results were Mark Redsell first, Rich Bago second and Steve Haley third. FTD went to Rich with a cracking 33.73 in R11. Well done guys and thanks to all for mucking in. Nice also to see some new faces with Steve and Brian calling in. I hardly dare mention we have a F3F Winter League event this coming weekend in case the weather gods hear me! But Hey Ho, what the heck. Fourth round of the Northern Winter League is this Saturday the 6th Feb. There done it, throw your worst at us!! Well it did! Rained ALL day and I mean rained. The comp was cancelled, yet again. Fingers crossed that out of this present rain and gloom we may actually get a good day next Saturday. Hmmm, who's betting? Well bet no more, the comp was cancelled after the forecasters showed a band of rain across the region between the morning and early afternoon. As it worked out the afternoon turned out bright with clear skies, contary to all forecasts. Oh dear, not looking good! High winds with gusts of over 50mph forecast and likely to be at Levisham ( SW winds ) probably makes the day un-flyable. We have tried Levisham before with high winds ( see report for Jan 2015 ) so unless something dramatic changes with the weather we aint going flyin' this weekend! Great start to the new season NOT! A band of rain is forecast to hit Horcum between 9am and some time after Midday on Saturday. What bad timing. Rain late, rain early, but not rain over the morning period. With shortening days, the best part of the day are the mornings. Sadly the Comp has been called OFF. Tykes ( Post Code YO60 7RB ) are Sunday Mornings 10:00 to 12:30. These meetings are for both Fixed Wing and Heli's. News letters, Competition and meeting reviews. Please note that there is a password required to view the Club News Letters which is available only to Club Members.